"Care for a round of golf?" is what Woot's community members said to each other on June 11, 2012; the day when the Sport Woot site launched and was offering a set of Adams Redline golf clubs. Of course deals are being offered on a wide range of sports equipment every day. So even if you're not into golf, you'll be sure to find something for the sport you love. Sport.woot.com currently ranks #12 amongst sites offering online deals -- DX Offers ranks #11. In the Sporting Goods category, Sport.Woot ranks at #1. 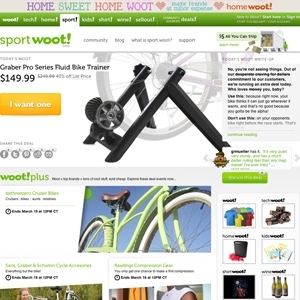 Sport.Woot is considered the most popular deal a day site, ranking in at #1. As for the 2nd most popular site, it's Giveaway of the Day.